Wreck this Journal ‘quickie’: Non-stop line. | An alien voice under a duvet of dreams. Posted by phoenixaeon in Art, WTJ. Well, I’ve ummed and ahhed about whether or not to put today’s page up, as it didn’t quite work out how I wanted; I got seriously confused, as I’m sure you’ll see. 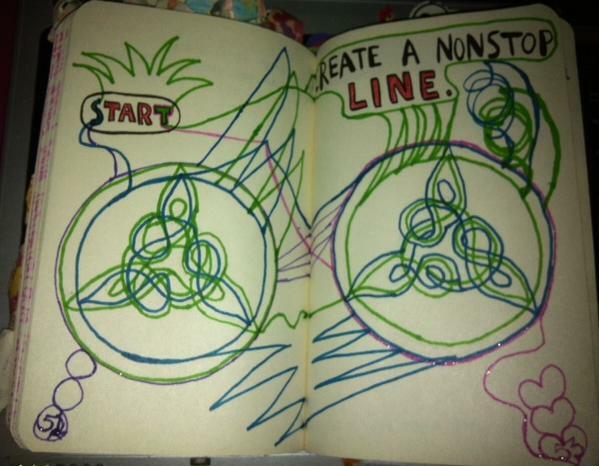 But as it’s St. Paddy’s day, and as it’s a Celtic design, here’s my awful attempt at the ‘non-stop line’ Wreck This Journal page.